On Sunday afternoon, South Africa was hit by the first round of load shedding for 2019. On Monday afternoon, Eskom implemented what’s called “Stage Four” load shedding, the highest possible intervention it can make. It is now certain that there will be much pain, for many months to come. The political and economic importance of Eskom cannot be overstated. Early in 2018, President Cyril Ramaphosa was able to appoint an Eskom task team while Jacob Zuma was still president. It was perhaps the most assertive step Ramaphosa had taken before he was able to fully remove Zuma. It showed, in one move, his political power – from that moment on, Zuma’s days in office were numbered. Then, Ramaphosa’s interventions – the appointment of the current board, and asking Phakamani Hadebe to take over as CEO – were widely praised. It appeared that Eskom was on the path to safety. Now it appears, however, that it was not known publicly quite how much trouble Eskom was in. The board tried to rein in costs, by stating it would not give workers an increase. The response from unions appears to have been to literally cut the power. While unions have always denied sabotage, Eskom says conveyer belts were cut and other machines damaged. This led to load shedding in 2018. Eskom’s problems may be reduced to two main categories: It battles to produce enough power, which is a technical problem, and it has a huge amount of debt, which is a financial problem. To fix the first, you would normally repair the problematic power stations and build new ones, or buy power from Independent Power Producers. This would require a huge amount of technical work, but is not philosophically difficult. For the financial side, you would raise the price that you charge for power, or you would ask the government for more money, or both. Again, the maths of this is not rocket science, although the amounts involved are literally astronomical. The fact that this is becoming so difficult points to the core of the problems: they are inherently political. Obviously, people won’t want to pay more for power. For any governing party in a democracy, facing voters while putting costs up is generally bad news. But in this case, a bigger problem arises – that if voters aren’t charged more, there may be no power at all. In terms of the election, the impact of this could well be that some voters who might cast their ballot for the ANC don’t bother. At the other end of the political spectrum, it could also push people who might have voted for the DA in the past but would not have bothered voting now, to actually get up and vote. In other words, people in suburbs might vote as a form of protest against the lack of power, while other voters might stay home in protest. However, that is unlikely to stop Eskom’s problems from being fixed. Rather, it is the constituencies inside the parastatal, or who used to be inside it, that might frustrate progress. Perhaps the biggest and most organised of these is the National Union of Metal Workers of South Africa, Numsa. At almost every microphone its leaders will criticise the Independent Power Producers programme, and claim that family members of Ramaphosa are benefiting. Fingers are pointed claiming that Patrice Motsepe has funded some of the producers, and that our first lady, Tshepo Motsepe, is Patrice Motsepe’s sister. However, this claim does not appear to explain how it came to be that the IPP programme started long before Ramaphosa even came to office. Numsa’s problem is that they organise among workers who are in the value chain now, primarily miners and handlers of coal. These are the people who will lose out as the economy changes; their skills and experience will not be needed anymore. Under the programme, Eskom would use fewer workers, and the number of people it employs itself would drop. For many of the Numsa members, this is almost an existential threat. Considering the current economic climate, and the lack of other jobs, there is much to lose. At the same time, considering that it is likely that suspected acts of violence and sabotage may well go unpunished, the case for power supplies to be disrupted might start to look a fairly cheap and effective way of fighting for their immediate interest. At the same time, there are other groups that share the same immediate interests as Numsa and the National Union of Mineworkers, NUM, (which also organises at Eskom). These are people who were pushed out of Eskom for alleged corruption. One such individual is Matshela Koko, who was its acting CEO and before that its Head of Generation. Remember, Koko was filmed on Carte Blanche explaining how he hadn’t signed a contract with the Guptas to help them buy a mine when the reporter then showed him the document he had in fact signed. He is also the person who lived under the same roof as his step-daughter who then received a billion rand in Eskom tenders. He has been consistently tweeting about the situation at Eskom, and blaming the current top management for the problems. So seriously does he take this mission that he has in the past paid to promote his tweets. In other words, he was paying to ensure that his tweets had a greater reach. It’s one thing for a bitter ex-employee to bad-mouth Eskom, but to pay to do it suggests that there may well be another motive. It is also unlikely that he is working alone, considering that the corruption he is accused of indulging in also involves other people. 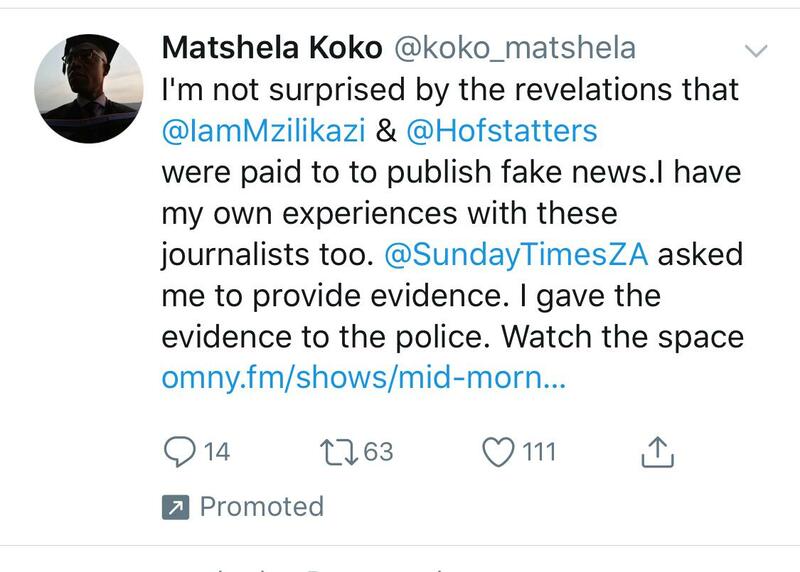 See image below – note the “Promoted” button on the tweet at the bottom. This suggests that one of the big problems the Eskom board is dealing with is that the people who want to frustrate it are complete insiders, they’ve actually run the parastatal before, and know how the levers of power operate. They also know how to further disrupt the giant company.